전문분야 교육학을 전공하신 20년 티칭경력의 베테랑 선생님이십니다. 미국 초중학교에서 선생님으로 재직경험이 있으신 분으로 문법, 발음 교정 확실하게 잡아 드립니다. 엔토 매니저님! Michelle 선생님은 어떤 분이신가요? 교육학을 전공하신 20년 티칭경력의 베테랑 선생님이십니다. 미국 초중학교에서 선생님으로 재직경험이 있으신 분으로 문법, 발음 교정 확실하게 잡아 드립니다. 선생님의 꼼꼼한 자기소개를 읽어보시면 좋은 선생님이란걸 알 수 있으실거에요. Hello, My name is Michelle. 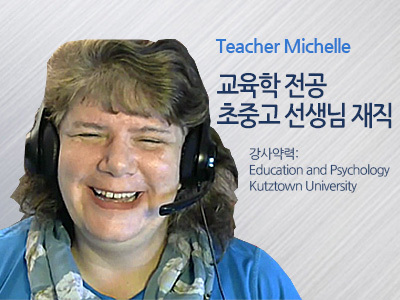 I have a Bachelor's Degree in Education and Psychology from Kutztown University in Pennsylvania. Kutztown University has trained teachers for over 100 years. I graduated and began teaching in 1991, and have over 20 years of experience. 안녕하세요. 제이름은 미셸입니다. 저는 펜실베니아에 있는 Kutztown University에서 교육학과 심리학을 전공하였습니다. Kutztown University는 100년이상 선생님을 배출해온 대학입니다. 저는 졸업후 1991년부터 티칭을 시작하였고, 20년 티칭경력이 있습니다. I currently live in Virginia Beach, Virginia near the ocean. My family and I enjoy spending time at the beach, and my children like to surf the waves. Virginia Beach is a very diverse city, and there are people from all over the world living in this area. I enjoy meeting people from different places and learning what their part of the world is like. 저는 현재 Virginia주에 있는 해안가 근처에 있는 Virginia Beach 에 살고 있습니다. 제 가족은 바닷가에서 시간보내는것을 좋아하며, 제 아이들은 서핑하는것을 좋아합니다. Virginia Beach는 다양한 사람들이 살고 있어서 전세계 여러나라에서 오신 분들을 만날수 있습니다. 저는 다른나라에서 온 사람들을 만나는것이 즐겁고, 다양한 문화를 배우는것이 너무 즐겁습니다. I have wanted to be a teacher ever since I was a little girl, and I was recognized by my high school teachers as the student most likely to become a teacher. In school, I was named Who's Who in American College students. After graduation, I was named one of Kutztown University's top 100 graduates. I graduated from school with highest honors and received several scholarships during college because of my good grades. 저는 어릴적부터 선생님이 되고 싶었습니다. 제가 다닌 고등학교 선생님은 제가 가장 선생님이 될것 같은 학생이라고 하셨습니다. 졸업후에 저는 최고 100개순위에 들어있는 Kutztown University에 진학하였고, 좋은성적을 받아 장학금도 여러번 받고, 최고영예 학생으로 졸업도 하였습니다. I enjoy helping people reach their full potential, and I believe that education is the best way to do this. I have had experience teaching children as well as adults. I have worked with homeschool students, private school students, and public school students. I have also worked as a tutor. Having taught for a quite a while has enabled me to hone my teaching skills and cater my lessons to student's specific needs. I am known for my patience and understanding with students. I try to be encouraging, yet honest with my students with my feedback. I have helped students with grammar and pronunciation. 저는 학생들의 잠재력을 깨워 도움을 주는것이 너무 즐겁고, 교육이야 말고 최고의 방법이라고 믿고 있습니다. 저는 어린이부터 성인까지 티칭경험이 있습니다. 저는 홈스쿨링 학생부터, 사립학교, 공립학교 학생들을 가르친 경험이 있으며, 또한 튜터 경험도 있습니다. 오랫동안의 티칭경험은 제가 가르치는 학생들의 니즈에 따라 레슨 플랜을 만들수 있는 티칭스킬을 키워주었습니다. 저는 학생들을 잘 기다려주고, 이해하며, 용기를 북돋아 주며, 솔직한 피드백을 학생에게 제공합니다. 저는 특히 문법, 발음에 관하여 학생들에게 도움을 주었습니다. I like to spend time with my family and pets. In my spare time, I garden, paint, and read. I am also a Scout leader; my two sons are Boy Scouts. I have six children ranging in age from 25 years old to 9 years old. Four of my children are currently attending college, two of them are studying to become teachers themselves. I look forward to meeting you and helping you to attain your educational goals! 저는 가족들과 애완동물과 시간을 보내는것을 좋아하며, 여유시간이 있을때 정원관리, 페인팅, 리딩을 합니다. 저는 또한 스카우트 리더입니다. 제 두 아들은 보이스카웃이며, 저는 9살부터 25살 사이의 6명의 아이들이 있습니다. 4명은 이미 대학에 진학하였고, 2명은 선생님이 되기위해 공부하고 있습니다. 여러분을 만나뵙기를 희망합니다. 여러분의 목표에 도달하도록 도울것입니다!